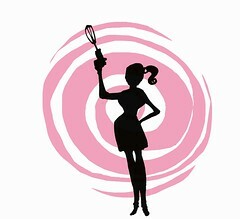 It’s one of those philosophical questions that all bakers and cooks must face at some point: when is a cake worth saving? You’ve baked an amazing dessert for a function, the house smells amazing, you turn over the bunt pan and … half the cake remains stuck in the pan. The good news is the kids can now have a piece of that delicious chocolate cake they’ve been smelling for the past couple of hours. The bad news is your cake is ruined. Or is it? Well, there’s the obvious solution of a glaze on top. Tried it. Still looks like the second hole on the golf course with all the missing divots. I needed something to cover the glaze and the flattened top. 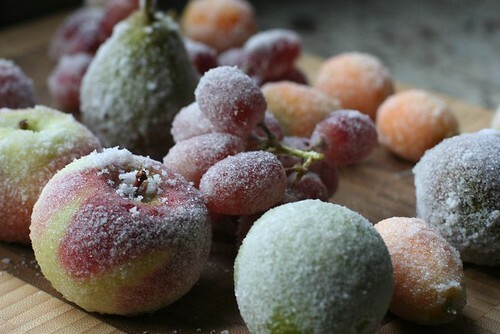 Sugared fruit is a wonderful and seasonally appropriate way to decorate a cake and cover a multitude of flaws. All you need is fruit (hard skinned fruit works best), egg whites (I use meringue powder) and super-fine sugar (pulse regular sugar in a food processor if you don’t want to make an extra trip to the market). 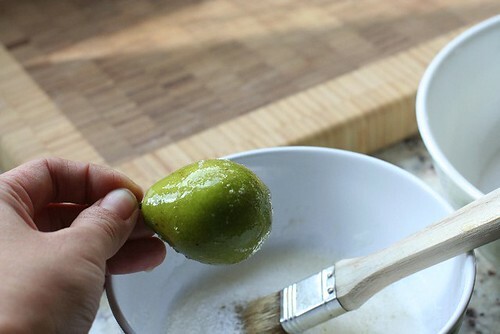 Simply brush the fruit with the egg whites, cover with sugar, and let dry. Simple as that! 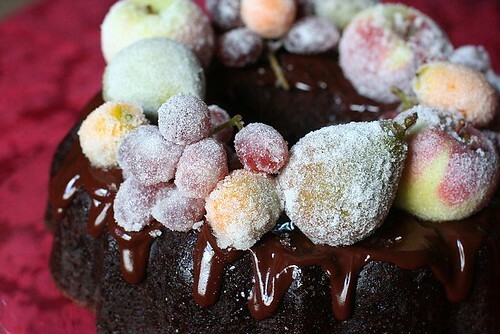 Doesn’t it look like I always meant to put those gorgeous sugared fruit atop my chocolate cake? It’ll be our secret. that’s such a great idea! thanks! and by the way, it looks absolutely yummy! 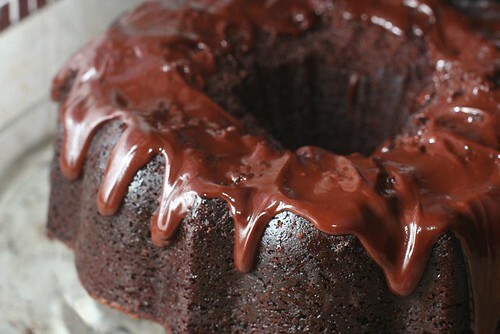 The cake looks chocolatey good and love the fruit! Excellent save. Sometimes when you’re up against the wall (due at a function WITH dessert in hand)creativity flows. have you tried the “glass fruit”? 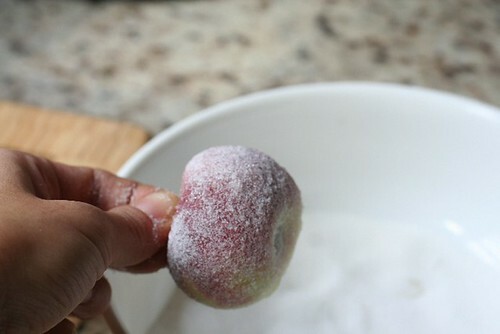 You boil sugar/water to the hard-crack stage and dip fruit (tangerine sections, berries, GRAPES–the stems make these perfect—) in to the candy and let cool on lightly greased parchment. They look stunning and are really fun to eat. Looks delish! Did your guests eat the sugared fruit as well as the yummy cake? 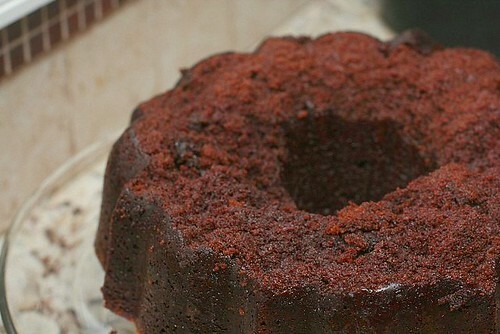 And btw: how DO you get a cake out of a Bundt pan w/out fear of this same problem you had? I try oiling and flouring, but sometimes even that doesn’t work OR, the flour comes out looking gross on the outside of my cake. I will try your chocolate cake recipe and report back. There were a couple of reasons the cake stuck. I definitely didn’t butter well and I slightly undercook it. I’ve made this cake at least three other times, and this was the only time it stuck like that. I have been raving about this cake since your party, along with most of the other things I tasted! It was fantastic and beautiful. Who new it was a save? And, yes I did see some guests eating the fruit! I wish I understood food the way you do…. That was a great way to save the cake, ingenious :). It looks beautiful; I’ll have to try that with fruit some time :)! Happy Holidays!